This entry was posted in General News, Students and tagged automotive, Lego, Samuel Ginn College of Engineering on April 12, 2012 by Wire Eagle. AUBURN – Lego sculptures have entered our shared cultural experience, whether they are created by a 3-year-old building his first space ship, or a serious artist using millions of blocks to create a one-of-a-kind installation on a grand scale. At Auburn University, Legos are being used to design and build vehicles, but with a twist. These vehicles can be produced at a rate of 70 cars per hour in the Samuel Ginn College of Engineering’s new automotive manufacturing systems laboratory, located on the ground floor of the Shelby Center. 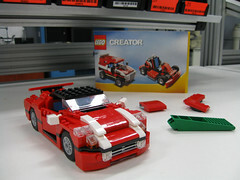 Students in the lab build three types of Lego vehicles: a 278-piece speedster, 254-piece SUV and 231-piece Baja car. The process requires 18 students, 15 for assembly operations and three for material delivery. The lab offers industrial and systems engineering students the opportunity to simulate real-life manufacturing operations, requiring them to understand the interdependence of all elements, from material receipt to delivery. By including equipment such as robotics, programmable logic controlled conveyors, electronic vision inspection and auto storage and retrieval for raw stock inventory, Devall can train students to program systems and learn the preventative and predictive maintenance they require. Students must determine optimal inventory requirements, work in process and final assembly for the production line while using a material pull system based on demand. They also look at error-proofing strategies, as well as training and safety plans. A video segment and photographs are available on the Auburn University Office of Communications and Marketing website at http://ocm.auburn.edu/featured_story/lego_lab.html.